Work is one of the essential functions during the human life span. We spend almost half of our lives occupationally active. Therefore, several different work-related determinants are affecting our lives. In recent years, there has been an increasing knowledge about work-related factors and their effect on health and functioning. Both cross-sectional and longitudinal studies have provided strong evidence that both positive and negative exposures in work influence our well-being. This chapter gives an overview of recent literature about the associations between work, working conditions, and health. Within this chapter, we summarize the current knowledge on the association between work-related determinants, both positive and negative, in relation to health and functioning. A special attention is paid to recent findings from the Finnish Longitudinal Study on Municipal Employees (FLAME), which has provided new knowledge about the long-term consequences of work extending even to old age. The association between midlife work and old age functional capacity will be discussed along with the potential factors on the pathway. Finally, interventions aiming to promote healthy and active aging by creating healthy working conditions are discussed. 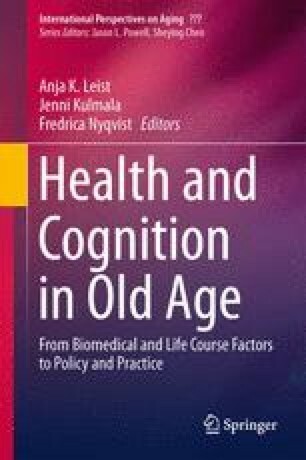 The chapter was reviewed by Professor Taina Rantanen (University of Jyväskylä, Finland) and Professor Clas-Håkan Nygård (University of Tampere, Finland). The preparation of the manuscript was supported by the Academy of Finland grants 250385 and 257239 and the European Regional Development Fund (EAKR) Project A31342 (Finland). The authors wish to acknowledge and thank the FLAME study group: Juhani Ilmarinen (Finnish Institute of Occupational Health, Finland), Clas-Håkan Nygård (University of Tampere, Finland), Jorma Seitsamo (Finnish Institute of Occupational Health, Finland), Matti Klockars (Finnish Institute of Occupational Health, Finland), Taina Rantanen (University of Jyväskylä, Finland), Mikaela von Bonsdorff (University of Jyväskylä, Finland), Monika von Bonsdorff (University of Jyväskylä, Finland), Jenni Kulmala (University of Jyväskylä, Finland), and Timo Törmäkangas (University of Jyväskylä, Finland).